More than 3,000 Scientologists, dignitaries and celebrities gathered to celebrate the dedication and opening of the new Church of Scientology and Celebrity Centre of Nashville on April 25, 2009. 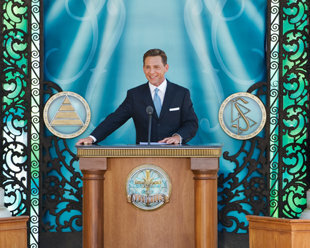 Mr. Miscavige led the ribbon cutting ceremony, joined by Church executives and special guests, to officially open the doors of the Nashville Church of Scientology and Celebrity Centre to all. This historic landmark, now home to the Church of Scientology & Celebrity Centre, has been fully restored to serve the growing Scientology congregation in Nashville, as well as artists who come from all over the world to Music City, USA. Visitors to the Church of Scientology & Celebrity Centre of Nashville are welcome to tour the interactive multimedia displays in the Public Information Center and so learn about the principles of the religion, the life and works of Founder L. Ron Hubbard, and Scientology’s global humanitarian programs. The chapel is the ideal setting for Scientology ceremonies, including Weddings, Naming Ceremonies and Graduations and is also open to the community for events, meetings and special occasions. The Church of Scientology & Celebrity Centre of Nashville preserves the unique and historic features of the 1898 local landmark building while accommodating all Scientology services for parishioners, community activities and introductory services for visitors. Originally built as Fall School in 1898, the Church of Scientology & Celebrity Centre of Nashville stands in the heart of Music City, USA, where its classic beauty has been preserved for Scientologists and their community for generations to come. “The new Ideal Org and Celebrity Centre signals great things for tomorrow. And when you couple that with our ability to recover to individuals their inherent creativity, our ability to reawaken dreams and restore the power to achieve those dreams, yes, we can now make good on what L. Ron Hubbard tells us regarding the artist as creating the beauty and glory on which cultures depend.